As the world is fast progressing towards digitization, nowadays, it is possible to use HTML 5 for the embedded videos. By embedding of HTML 5 videos into an email, subscribers are able to watch brilliant masterpiece videos immediately. This article is basically written for teaching you how to embed the HTML 5 videos into the email. Adjacently, we have shared the information about the failure techniques that workouts when the video doesn’t get displayed in the email inbox. For increasing open-rates of the emails, videos are embedded in the email inbox. Through a survey report, the results show that with the aid of videos, the open-rate of the email increases from 7% to 13% A recent study manifest that using videos in the email increases 55% click-through rate, 24% hike in conversation-rate, 20% growth in ROI and 44% more time the clients are spending on the emails. On an overall, 40% higher revenue is being earned by the video marketers through the videos embedded in the email. HTML 5 videos are having less support from the marketers, but the supporters are strong enough and individually they are holding more than half of the shares in the market. 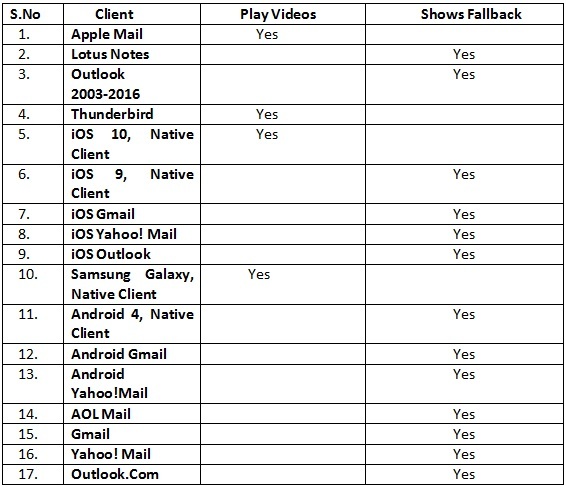 Native iOS, Apple Mail and Samsung allow the video to get played in the client’s inbox, but the other clients such as Android and Gmail gives you a fallback image instead of video. 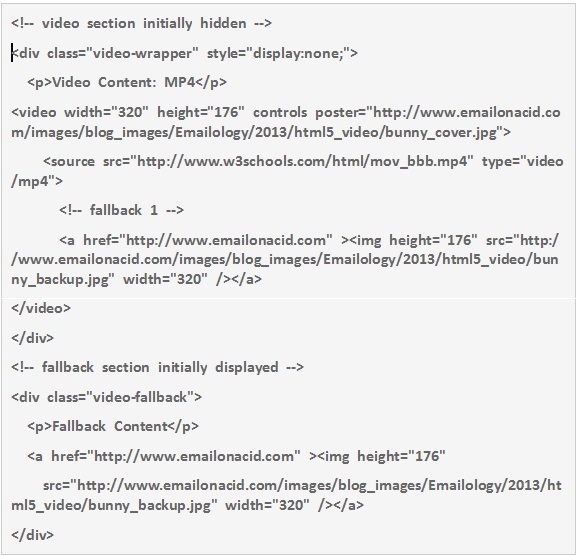 Only MP4, OGG and WebM video formats are being supported by HTML5. Apple only supports MP4. In case, you are using Apache web server, make sure you are using the .htaccess file. Proper configuration is needed for giving the correct MIME type to the server. Through the proper configuration, the client has the ease to detect the proper video format at the time of retrieving the videos. A few years back on, it wasn’t easy to embed videos into the emails. Earlier, a static image superimposed with a play button was used. It was made to seem appear like a playable video.But, when the users click on the video, they automatically get redirected to a new page where the video is being hosted by a social video site or YouTube. While the other marketers plans a different strategy and use animated GIFs or cinemagraphs instead of a static image. It is a nice strategy to have a proper solution for the HTML5 videos and static images. ImgFlip, GifLike and GifSoup are the tools that help in the creation of animated GIFs. Embedding videos in the email have its own pros and cons. But, the user experience is highly increased by using the embedded videos in an email. Being a cool invention, embedded videos acts as an amplifier for increasing the open rate of the email. Try to use static images or GIFs and interlink it with the landing pages of your website.